The IPOB-ELS2IR-EP is the newest 2MP/1080P Indoor/Outdoor Bullet Security Camera from our Elite series. You’ll get HD security video with the latest features available today. It has the ability to send a 1080p true HD signal to your NVR, which is the ultimate end result when you are dealing with security recording. High Definition cameras like this bullet can capture incredible detail when compared to analog cameras. Think about it if you ever need to zoom in on your footage to see details or features of criminal activity. Think about whether you want pixelated or crisp, clear images when you need to see a tattoo, clothing, scars and possibly even a license plate. With a ton of features, this camera will quickly become a favorite for your home or business. The Smart H.265+ codec is what you get when you upgrade from the H.265 codec and allow for more optimized data compression that reduces your bit rate and storage requirements by up to 70% over the H.265 compression standard. IVS or Intelligent Video System is the video analytic feature that lets the camera monitor specific areas within a scene and determine if violations like intrusion detection, tripwire violations, and even the ability to recognize dramatic changes within a scene and generate a message to check the camera. The 1/2.8” 2MP progressive scan STARVIS™ CMOS is another part of that advanced technology that makes this camera so versatile. Starlight ultra-low light technology uses optical features to balance the available light to produce clear, color images with very little light. The camera also has a 3.6mm fixed lens that will provide you with an overview of your surroundings, whether it's a parking lot, yard, warehouse, store etc. We always recommend pairing this fixed lens camera with a varifocal lens camera, so you’ll get overall coverage and you can use the varifocal in strategic locations where close up images are more necessary. Wide Dynamic Range or WDR will efficiently take lighter and darker frames within a scene and combine them to produce a more accurate image without as much contrast. At night, this camera can see up to 131 feet thanks to its Infrared LEDs. The ability to see at night is very important and the Infrared capabilities make this camera the perfect fit in areas with little or no light. Easily power this camera with your choice of a standard 12V DC power supply, PoE or use the latest ePoE (extended PoE) that allows transmission distances of 2,624 feet @10Mbps or 984 feet @100Mbps. 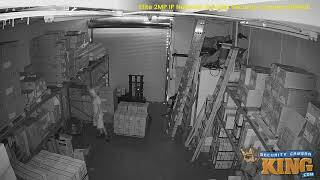 Included with this 2MP bullet security camera is a 2 year full warranty, FREE US based tech support and FREE remote viewing software.